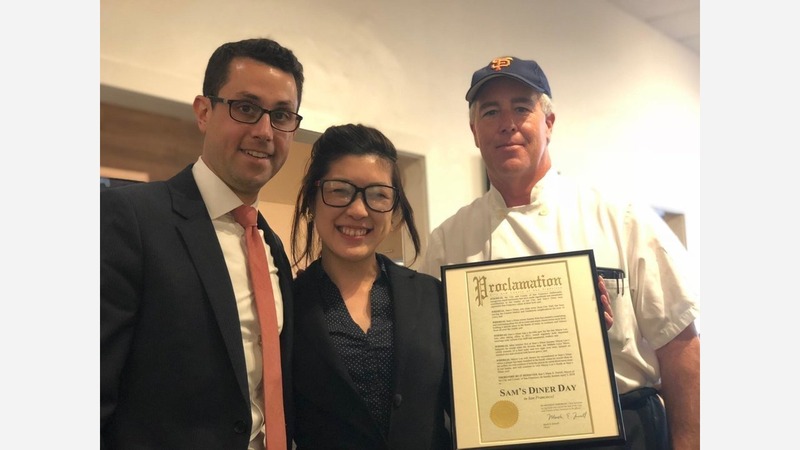 In honor of late Mayor Edwin M. Lee, April 5th will be now be known in San Francisco as "SAM's Diner Day," city officials have proclaimed. SAM's American Eatery--also known as Sam's Diner--is located just a few blocks away from City Hall at 1220 Market St., and was one of Lee's preferred eateries. 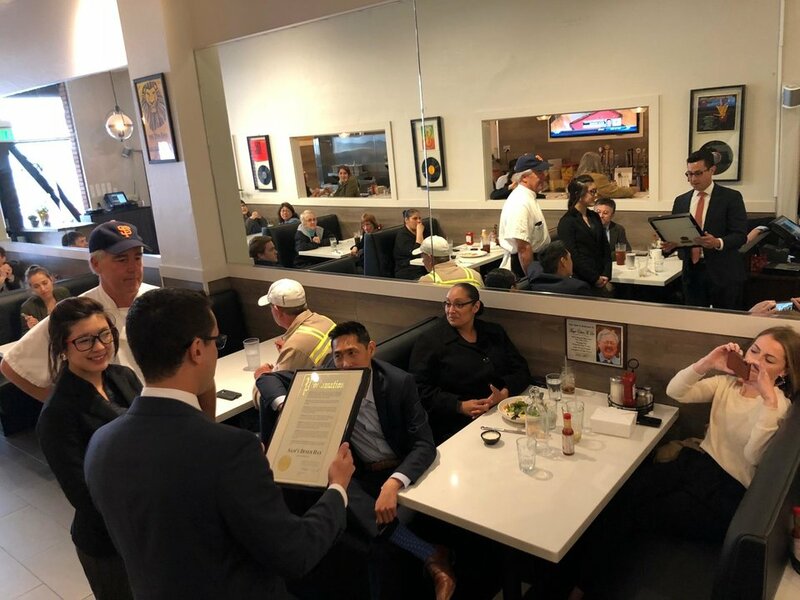 The late mayor began frequenting the establishment in 2012, often praising owner Jeannie Kim's decision to invest in the revitalization of the Mid-Market district, according to former staff members. Lee often held meetings at his favorite table, notoriously arriving at least 30 minutes early to "have coffee and gather his thoughts," she said. After Lee established himself as a regular, Kim and her staff set aside table five as his table, partially because it offered the most privacy in the restaurant. Matthew Goudea, Jason Elliott and Nicole Elliott at table five. 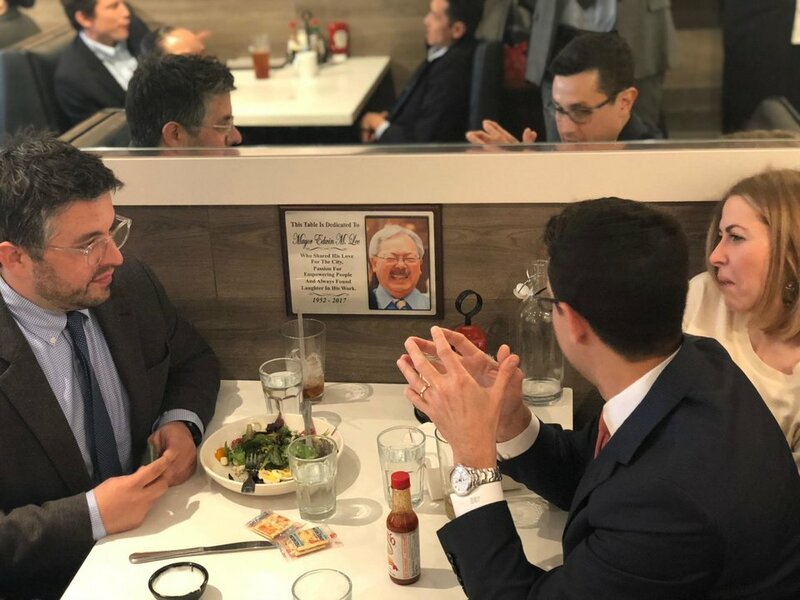 In Lee's honor, Kim installed a plaque at his table, snapped a photo and sent it off to members of the Office of Economic and Workforce Development. "Thought you should see this first," Kim wrote. 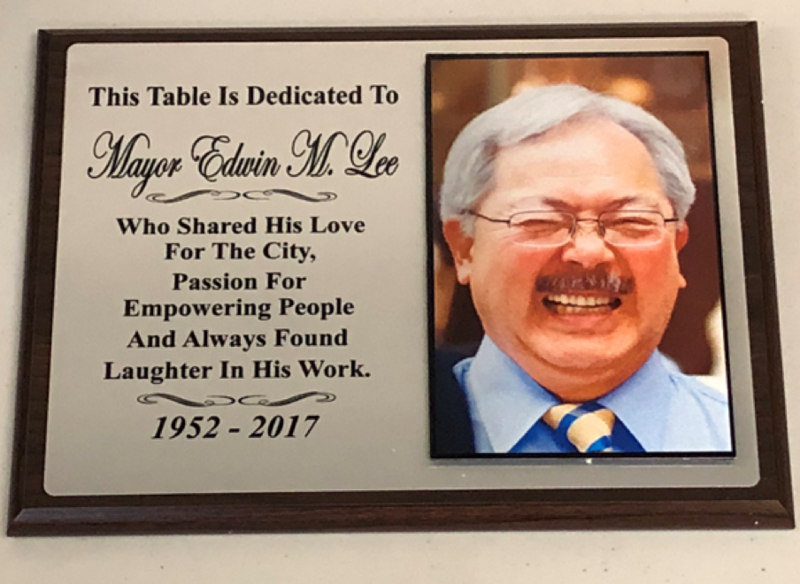 "This Table is Dedicated To Mayor Edwin M. Lee, Who Shared His Love For the City, Passion For Empowering People And Always Found Laughter In His Work. 1952-2017," the memorial reads. Once news of the tribute traveled around City Hall, some of Lee's former staff held a tribute luncheon in his honor to swap stories and order some of his favorite dishes. Plaque dedicated to Mayor Edwin M. Lee at table five. SAM's Diner employee Shoovdor Tsedendorj said some of Lee's go-to meals were the Mahalo Loco Moco and the bacon pancake breakfast. Tsedendorj said he always took his coffee black, his pancakes with extra butter, and his loco moco medium with extra gravy. Following the lunch, Lee's former chief of staff Jason Elliot--who's now serving Interim Mayor Mark Farrell--addressed other patrons and restaurant staff and presented the official city proclamation to manager Gabriella Gomez, Tsedendorj, and chef Neil Marquis on Kim's behalf, to applause from diners. Outside, "it was another day of theatre on Market Street, but a civic kind, for SAM's Diner," an OEWD representative told Hoodline. "The meal finished and the check paid, the staff left it on the table overlooked by a smiling Ed Lee." Todd Rufo, Nicolle Elliott, Myisha Hervey, Gabriella Gomez, and Chef Marquis listen to Jason Elliot proclaim April 5th "Sam's Diner Day." SAM'S DINER DAY in San Francisco!